As we keep ’em in the air, we might recall that it was on this date in 1900 that Luther Haden “Dummy” Taylor made his Major League debut. A deaf-mute right-handed pitcher, he was a key feature of the New York Giants’ National League championship teams of 1904 and 1905. Taylor communicated on-field with his teammates– all of whom learned sign language– with his hands. He is credited with helping to expand and make universal the use of sign language throughout the modern baseball infield, for example, the use of pitching signs. 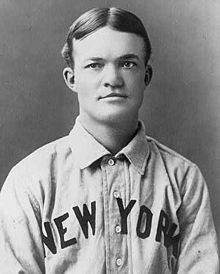 And Taylor contributed to signing’s repertoire of profanities, frequently cussing out umpires with his hands (and largely getting away with it… except when, as with Hank O’Day, he encountered a ref who knew sign language). Taylor was also a consummate showman, an accomplished juggler who would often put on “a grand juggling act” in front of the Giants’ dugout to amuse the fans.